The WWM is going to be the star of the show! We are featuring the WWM at the AHR Expo 2018. Check us out at Booth #2143 at McCormick Place in Chicago from January 22-24, 2018. See what the WWM is all about! We will also be featuring many units from our product line, so come stop by. The WWM is one of the most revolutionary units the industry has seen and is considered the world's first stackable modular water to water unit. Click here for the newly posted WWM Unit Diagram and CAD Drawings! Up to 32 connectable units and each module has 15 HP circuits. The modules can be linked together side by side, back to back, and stacked to reach a capacity of 960 tons. No clearance required on the top, sides, or back. 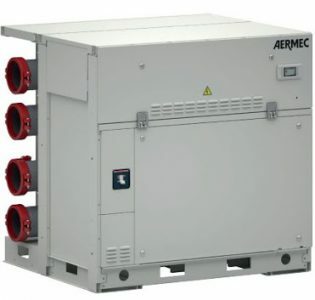 Each individual module is an independent indoor chiller for producing cooled water with high-efficiency scroll compressors and plate type heat exchangers. Each unit has its own electrical panel, and the control logic ensures that every module can work together with the others, guaranteeing continuity even if one module malfunctions or goes into lockout. A unit(s) may be removed for maintenance without shutting the system off. The real advantage of this unit it the high efficiency and small footprint as our modular system can save up to 60% of floor space over the competition. The precise choice of components, the special configuration, and the possibility to connect several independent modules and manage them as if they were a single unit are all aspects that guarantee maximum output at full load, whilst ensuring continuous adaption to service needs.